Since 1996, the Syncro group has been perfectly personalizing van upfits, thanks to the vast gamut of shelving and drawer units, floor panels, interior paneling and linings, roof racks and accessories. Expert Syncro technicians always find the very best solution for each client's individual needs – creating upfits that really work for the client. One of the key factors of an upfit is locking cargo in place for safe transport, thus avoiding expensive breakage problems, and ensuring that both you and other drivers are safe while on the road. 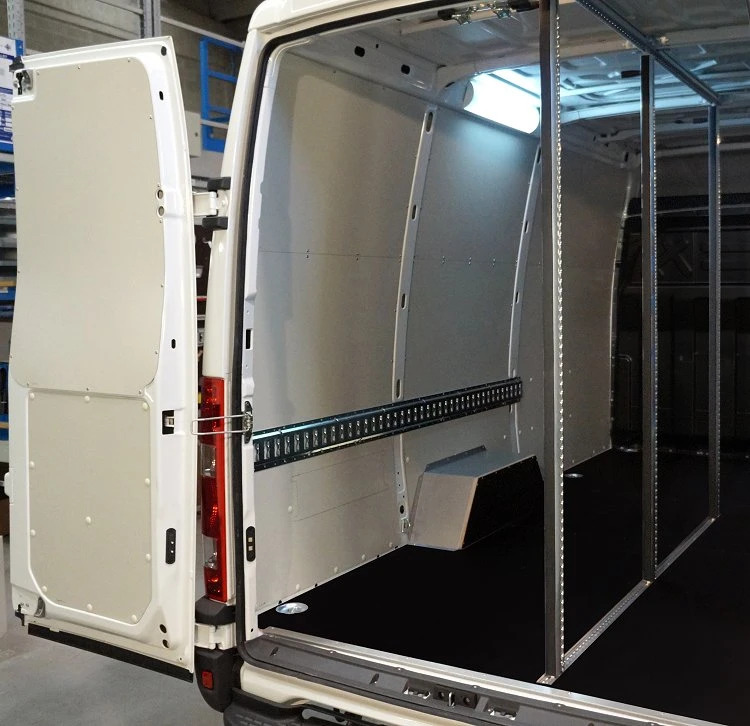 On this page, we see an example of a Daily upfit that consists of a few basic racking components, various accessories and three notched aluminum load lock bars. But let's start at the beginning: the first step in this Daily's upfit was installing the interior protective linings. 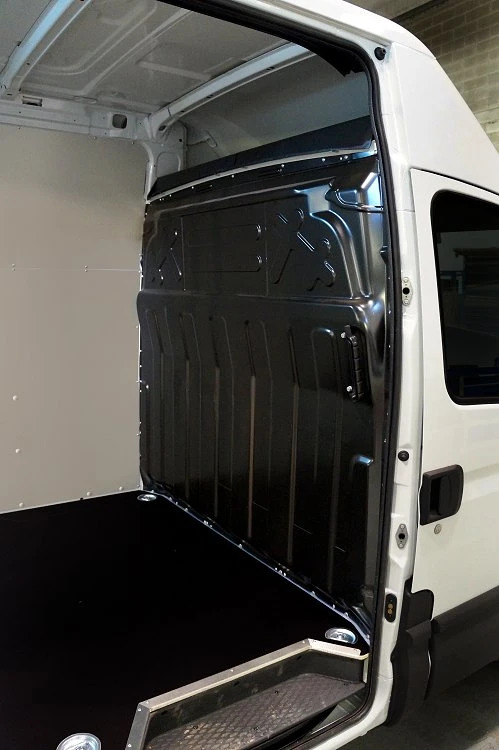 Syncro technicians installed the 12 mm resin-coated plywood floor panel, complete with recessed steel anchorage points where hooks and straps can be attached, and non-slip steel borders where the van doors open. 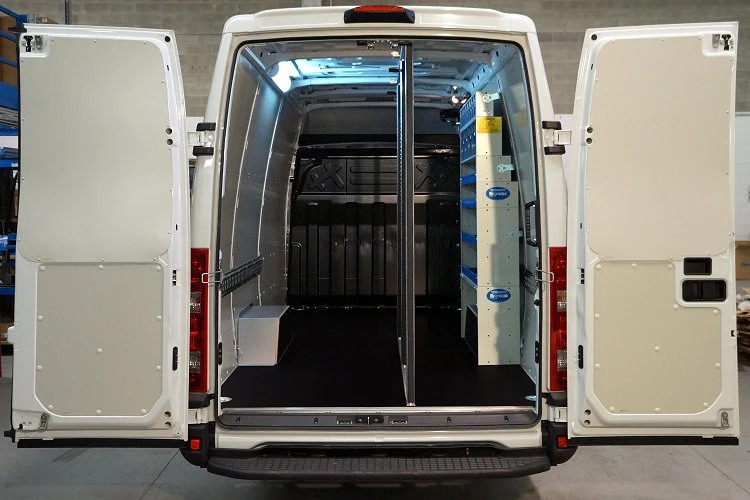 The floor panel serves three purposes: it prevents damage to the original van floor, creates a solid flat surface necessary for loading and unloading, and creates the base for mounting racking components. To protect the entire cargo area, including the side and back doors, we mounted precision laser-cut, pre-coated galvanized steel paneling. 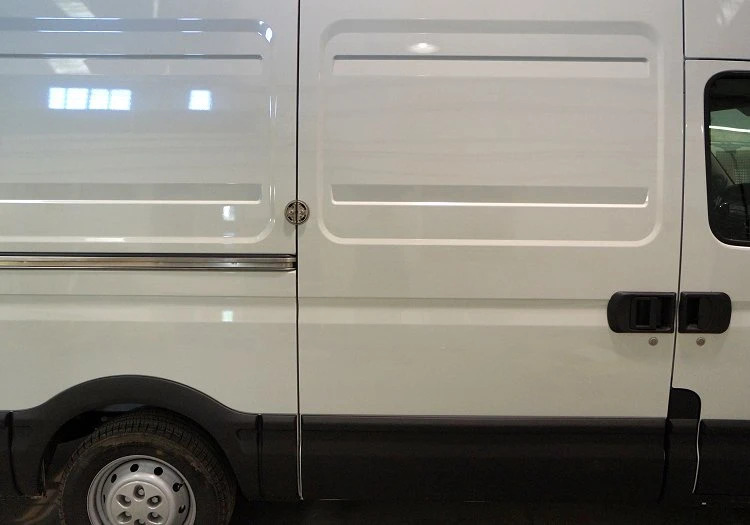 Not only do they provide superior protection against dents and bumps, but they give the van a finished professional look. The wheel arches are protected by a pair of extra tough galvanized steel and 12 mm plywood covers. The racking components are minimal: a shelving unit mounted over the right-hand side open wheel well arch frame. All four shelves have raised sides and come with rubber mats and aluminum dividers. Above the shelves, we mounted a metal drawer unit with forward-tilting clear plastic drawers - a super practical solution, because all contents can be easily seen and quickly accessed. Each drawer is equipped with its own automatic locking system, and there are no extruding parts that can be bumped into or broken off. There are four 24 cm drawers complete with aluminum dividers, and six 16 cm drawers. For this upfit, we fixed two steel tracks on the left and right-hand side walls to be used with Syncro straps and clasps system to lock down cargo. 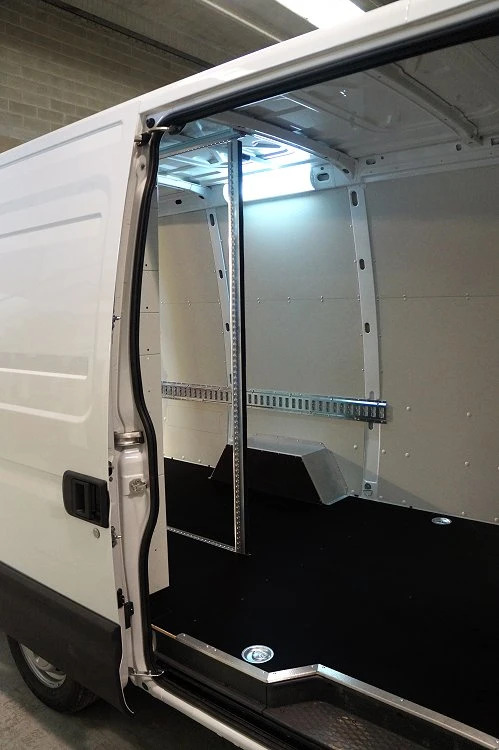 In the center of the cargo area, there are three Syncro exclusive notched load lock bars with rubber coating which are inserted into tracks mounted on both the ceiling and floor. The bars have a special spring action design, so they can be inserted, moved and or removed in seconds. If needed, other bars or straps can be added to notched part of the original bars. Important to note is the floor track, which inserted into the floor panel so as to not interfere with loading and unloading. The bright lighting is guaranteed by a strong 18 Watt neon ceiling light, powered by the van's 12 Volt electric current. And last but certainly not least is the UFO plus locks installed on the Daily doors – an extremely efficient theft deterrent. Click here to see an upfit with load lock poles, a Daily with small van crane and generator/compressor, an upfit with a generator and compressor, an upfit with ladder rack, a Daily with shelving units. Check out other Daily upfits with interior linings and roof racks. 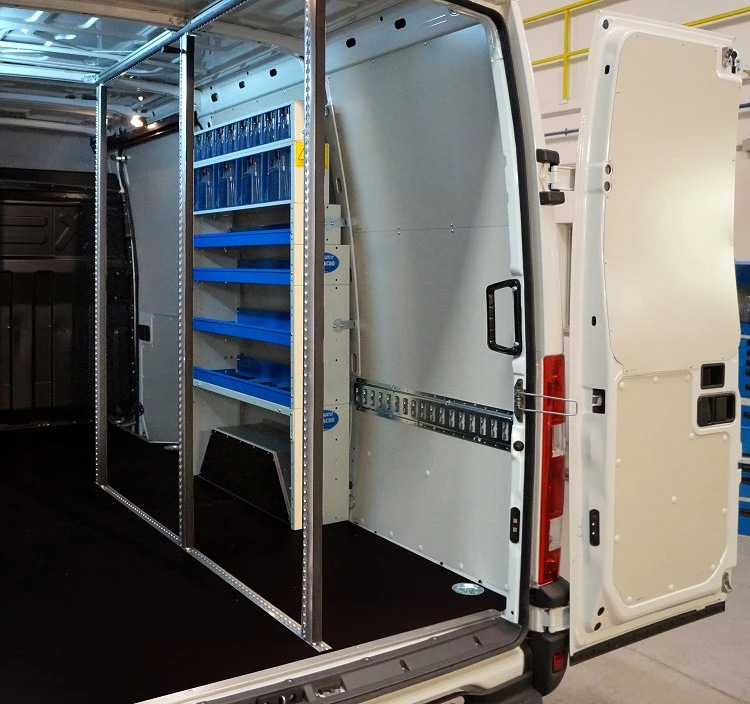 An Iveco Daily upfit with shelving components, floor lining, systems to block cargo, and Daily van accessories.